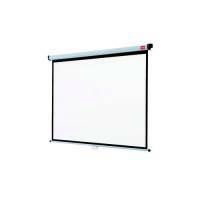 This Nobo 4:3 Wall Mounted Projection Screen has a brilliant white matte surface that provides a sharp and detailed image that is ideal for viewing in meetings and presentations. The screen is easy to retract back into its housing when not in use, protecting it from damage. It can be mounted to either a wall or a ceiling and has a wide viewing angle for great visibility. 4:3 format, designed for DLP. LCD projector use. Ensures screen is closed up when not in use - the housing keeps it dust-free. Ideal when a permanently fixed screen is required. Smart black border for a professional, sharp edged image. Suitable for OHP use - extension brackets are available to eliminate keystone effect. Wall or ceiling mounted using the two-way end cap brackets.